Mysore pak is traditional age old sweet with rich flavor of ghee and Besan or gram flour. 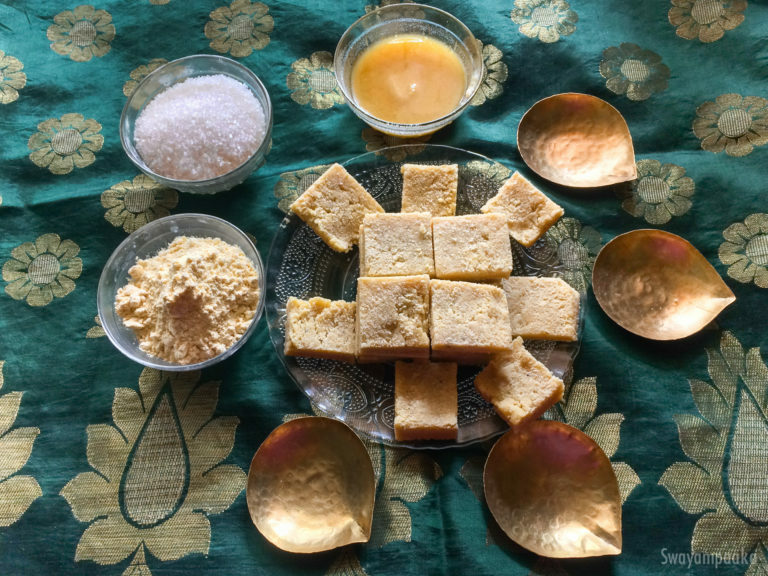 It is believed to be a royal sweet.. Now we prepare it for the festivals ..Deepavali is here so try this soft, melts in the mouth There are many different ways this mysore pak can be prepared, this is definitely a fail proof recipe. Every time you will get the soft Mysore pak ! This recipe is from my friend Shaila. Powder the sugar along with cardamom and keep it ready. Dry roast the besan on medium low heat for 2 minutes in thick bottom pan/banale and turn off the heat. To this add ghee, powdered sugar and milk. Mix it well, make sure there are no lumps. After 5 to 6 minutes the sweet mix starts to leave the pan. Once it starts to leave the pan and see the layers, transfer this onto the greased plate. When it is still warm cut this using greased knife to desired shape and size. Enjoy this Soft Mysore pak with your family and friends!